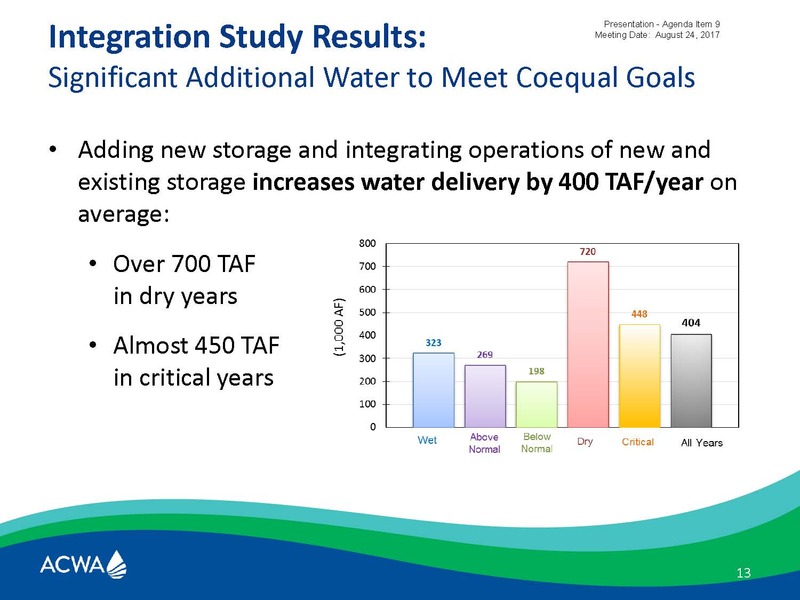 In July of this year, the Association of California Water Agencies (ACWA) released a study, 21st Century Water Infrastructure: New Approaches to Create Flexibility and Resiliency, which examined how the state’s water supply system could operate more flexibly and effectively with the addition and integrated operation of new storage capacity. 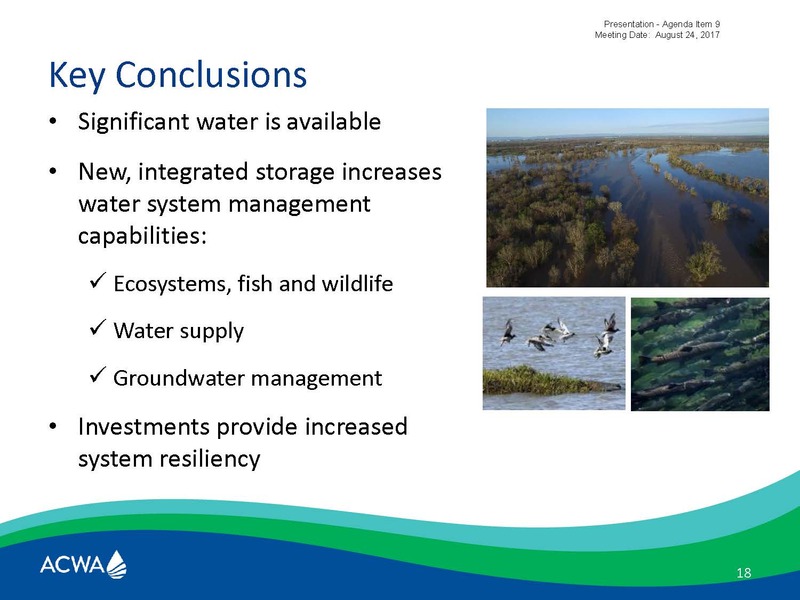 At the August meeting of the Delta Stewardship Council, ACWA’s David Bolland provided an overview of the study for council members. 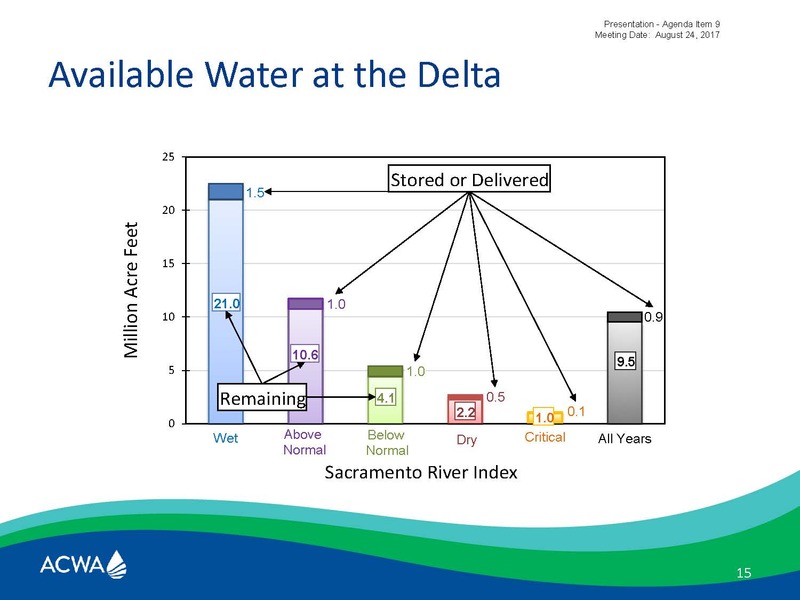 Mr. Bolland said that the study does not presume that all water would be going to consumptive uses for cities and farms, but that it would be used by state effectively to meet all of the goals, specifically the coequal goals that are in the center of the Delta planning process, but that concept of coequal goals has been brought to a larger scale in statewide water management. 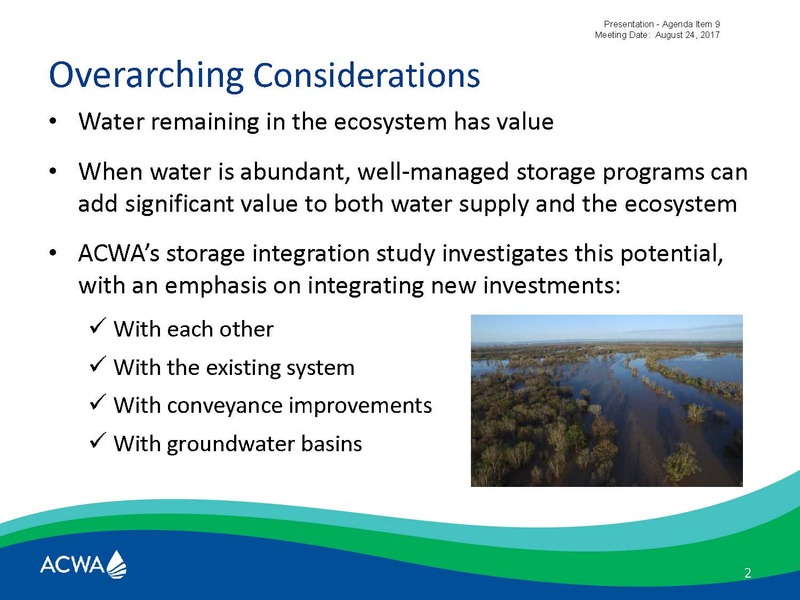 Many policy documents by ACWA and the state have called for storage improvements as part of a robust, ‘all of the above’ management scenario, such as the ACWA Blueprint in 2005, the Delta Plan, ACWA’s State Water Action Plan, and the California Water Action Plan. 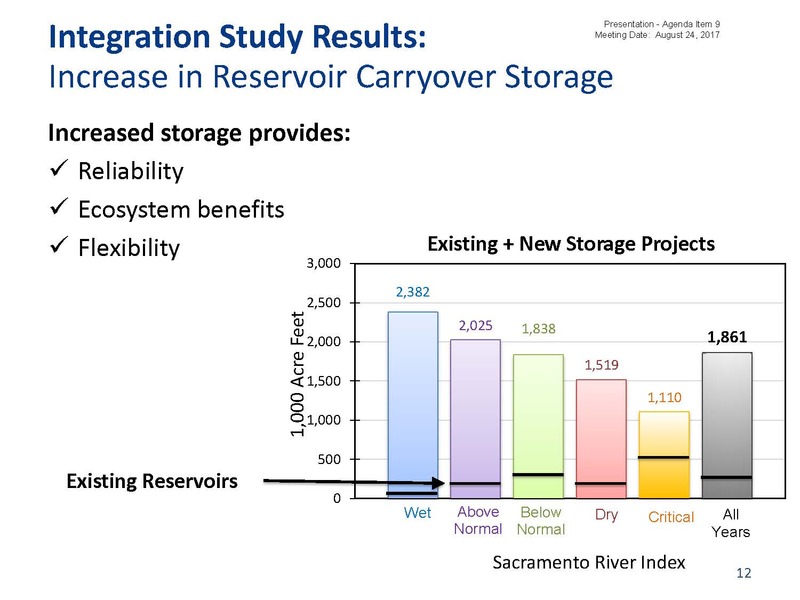 Then Prop 1 passed in 2014, which had $2.7 billion for storage. 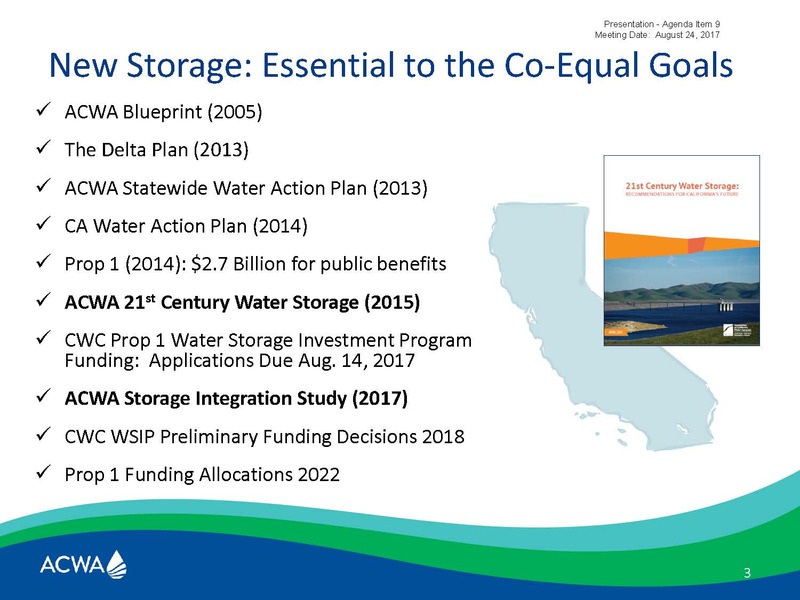 ACWA provided some policy direction and recommendations for storage investments in their 21st Century Storage Policy in 2015. 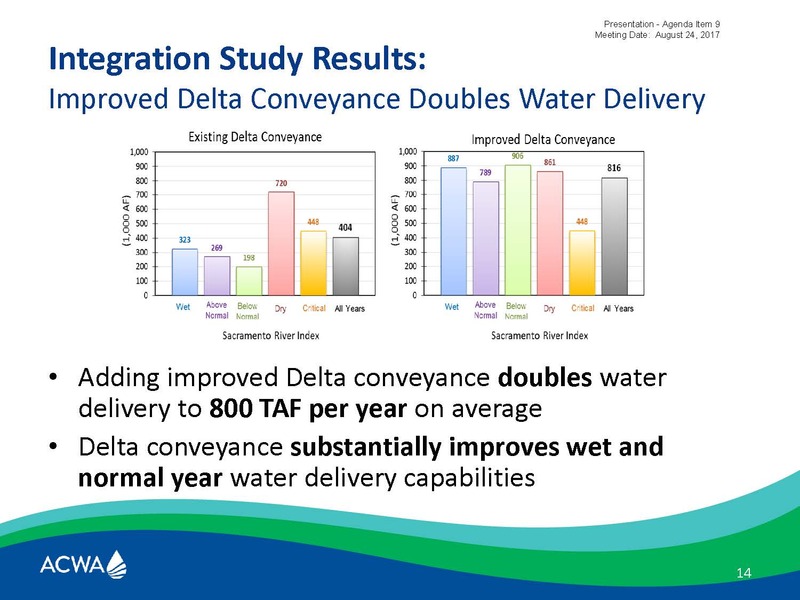 ACWA’s integration study is intended to inform the Water Storage Investment Program process, as well as other policy contexts such as the Delta Plan Conveyance, Storage, and Operations Amendment and other decisions that the state is making. 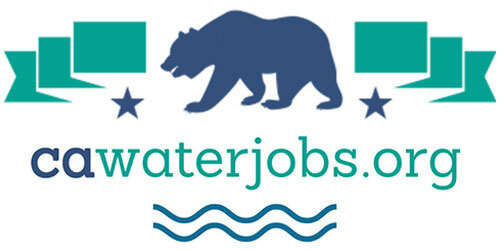 The study looks at comprehensive solutions for water quality and water supply challenges in California – not only surface storage and groundwater storage, but also with and without new conveyance, stormwater capture, recycling and desalination, conservation, demand management, transfers, and even the significant need for investment in forest management and our headwaters. 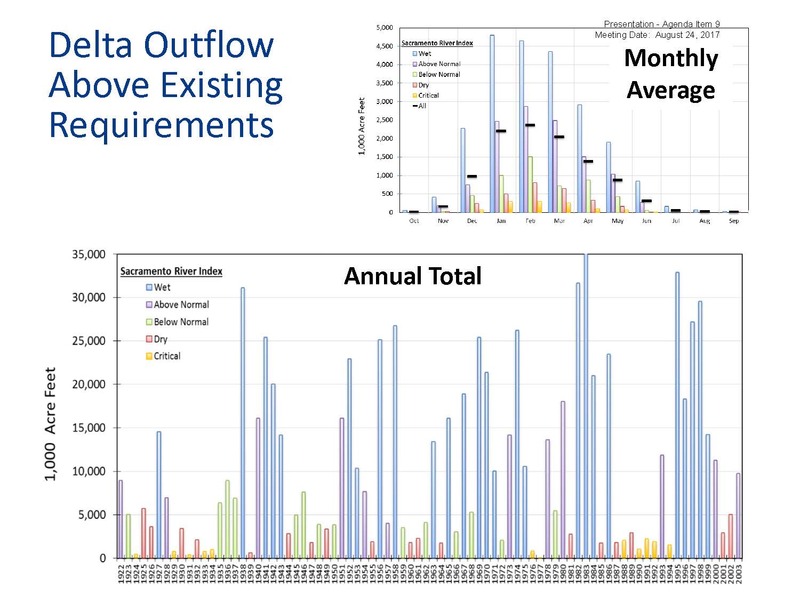 The operational assumptions in the modeling were existing regulatory requirements, existing management responsibilities, flood flows, storage operations, and all of the assumed status quo; they added the projects, and then performed the analysis with and without the California Water Fix. 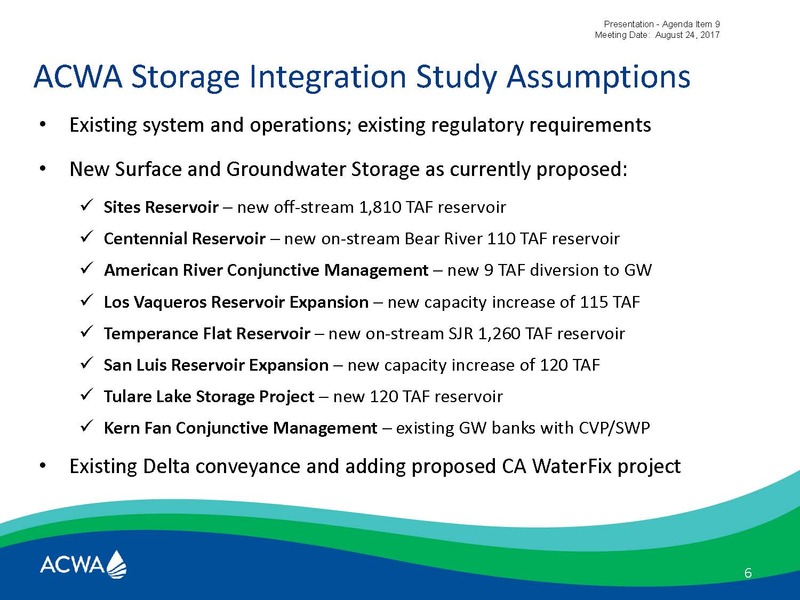 Mr. Bolland presented a slide showing the locations of the eight new storage projects considered in the study, and noted that if all eight projects were built, it would add 3.5 MAF of storage to the system. 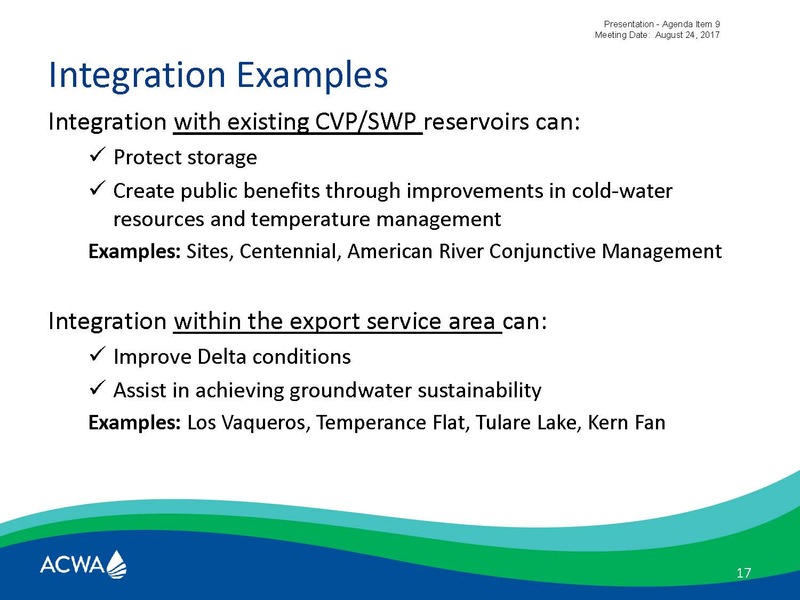 Adding new storage and integrating operations of new and existing storage would increase water deliveries by about 400,000 acre-feet south of the Delta for various purposes, much of which would probably be moved into groundwater, he said. 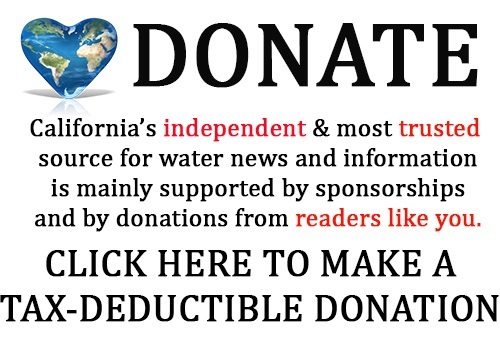 “In dry years, up to 700,000 acre-feet, and even in critical years up to 400,000 acre-feet, and that’s pretty important,” he said. 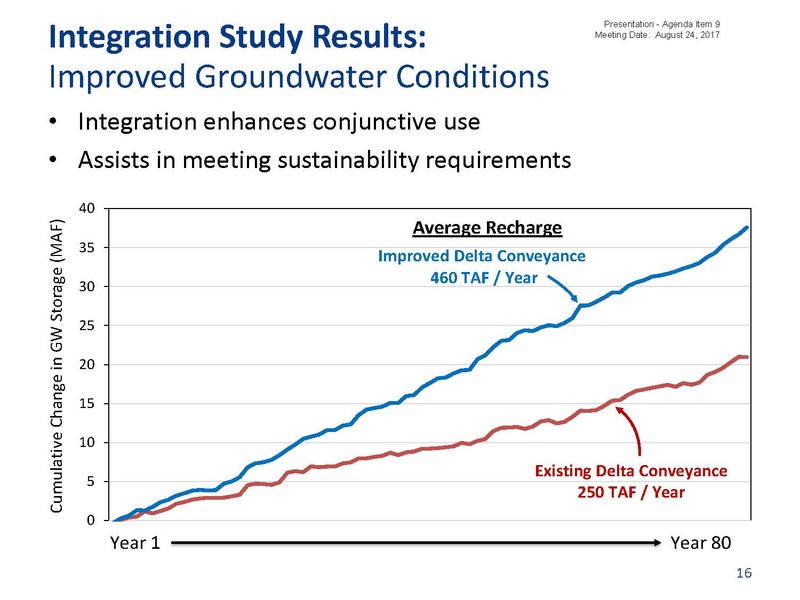 During the discussion period, Vice Chair Susan Tatayon asked if any of the projects in the study should come online first in order to open the doorway to more flexibility in the future? 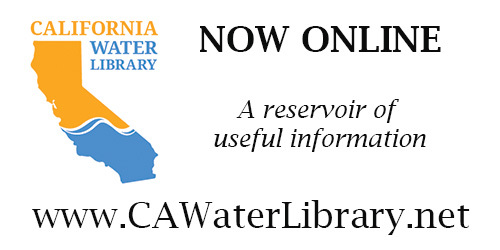 Click here to download a summary or a copy of ACWA’s report, 21st Century Water Infrastructure: New Approaches to Create Flexibility and Resiliency. 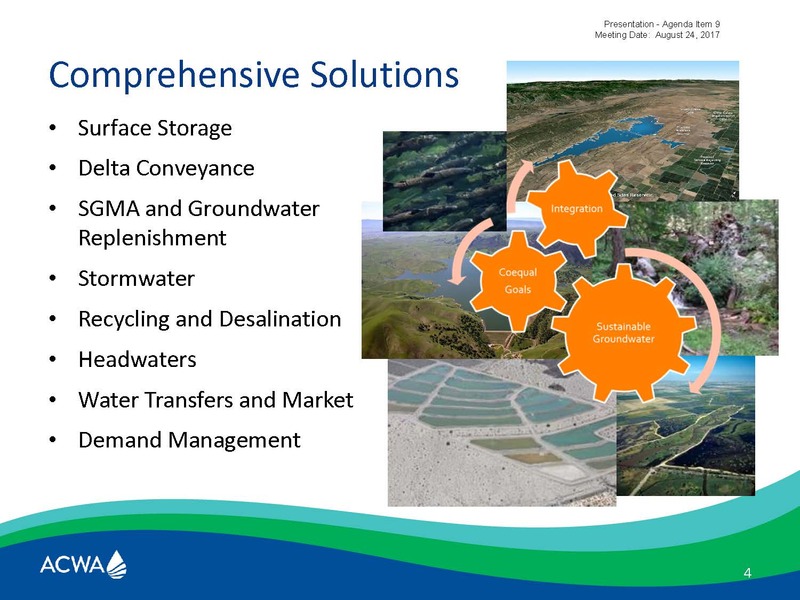 Click here for the full agenda and meeting materials for the August meeting of the Delta Stewardship Council.